Invoices are generated for orders at the end of billing period when the Billing Cycle runs. The Billing Cycle is the period of time between billings and has 3 primary attributes: billing start date, billing end date and the run date. The Billing Cycle can be configured by navigating to System>>Configuration>>Billing Configuration. The Billing Configuration controls how often the Billing Run must take place. The Billing Run can be configured to take place every month or every day..etc. Based on the Billing Configuration, the invoices are automatically generated by the system. 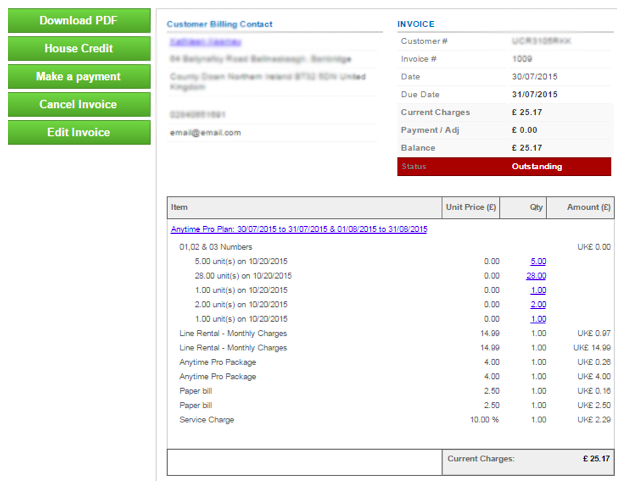 This Invoice can also be downloaded onto the local machine system as a .pdf document. Note: Invoice Templates for both web view and pdf can be changed by navigating to System>>Invoice Template. If you require a customized template please contact support@blusynergy.com.